Vishnu is among the most important deities of Hinduism. Together with with Brahma and Shiva, Vishnu forms the principal trinity of Hindu religious practice. In his many forms, Vishnu is regarded as the preserver and protector. Hinduism teaches that when humanity is threatened by chaos or evil, Vishnu will descend into the world in one of his incarnations to restore righteousness. The incarnations that Vishnu takes are called avatars. The Hindu scriptures speak of ten avatars. They are thought to have been present in the Satya Yuga (the Golden Age or Age of Truth), when mankind was ruled by gods. Collectively, the avatars of Vishnu are called dasavatara (10 avatars). Each has a different form and purpose. When an individual is faced with a challenge, a particular avatar descends to address the issue. The myths associated with each avatar reference a specific period of time when they were most needed. Some people refer to this as the cosmic cycle or the Time-Spirit. For instance, the first avatar, Matsya, descended long before the ninth avatar, Balarama. More recent mythology states that Balarama may have been the Lord Buddha. 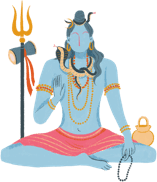 No matter the specific intent or place in time, the avatars are meant to re-establish the dharma, the path of righteousness or universal laws taught in the Hindu scriptures. 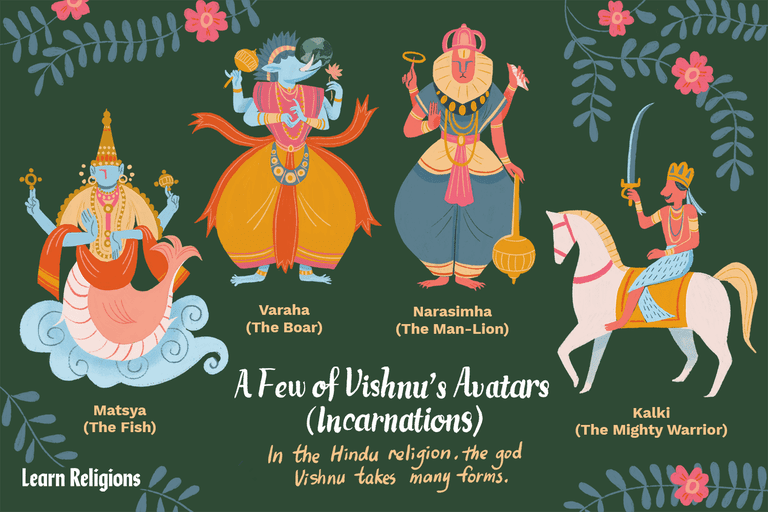 The legends, myths, and stories that include the avatars remain important allegories within Hinduism. Matsya is said to be the avatar that rescued the first man, as well as other creatures of the earth, from a great flood. Matsya is sometimes depicted as a great fish or as a human torso connected to the tail of a fish. Matsya is said to have forewarned man about the coming flood and ordered him to preserve all the grains and living creatures in a boat. This story is similar to many deluge myths found in other cultures. Kurma (or Koorma) is the tortoise incarnation that relates to the myth of churning the ocean to obtain treasures dissolved in the ocean of milk. In this myth, Vishnu took the form of a tortoise upon which to support the churning stick on his back. The Kurma avatar of Vishnu is usually seen in a mixed human-animal form. Varaha is the boar that raised the earth from the bottom of the sea after the demon Hiranyaksha dragged it to the bottom of the sea. After a battle of 1,000 years, Varaha raised the earth out of the water with his tusks. Varaha is depicted as either a full boar form or as a boar head on a human body. As the legend goes, the demon Hiranyakashipiu obtained a boon from Brahma that he could not be killed or harmed by any means. Now arrogant in his security, Hiranyakshipiu began to cause trouble both in heaven and on earth. However, his son Prahlada was devoted to Vishnu. One day, when the demon challenged Prahlada, Vishnu emerged in the form of a man-lion known as Narasimha to slay the demon. In the Rig Veda, Vamana (the dwarf) appears when the demon king Bali ruled the universe and the gods lost their power. One day, Vamana visited the court of Bali and begged for as much land as he could cover in three steps. Laughing at the dwarf, Bali granted the wish. The dwarf then assumed the form of a giant. He took the whole earth with the first step and the entire middle world with the second step. With the third step, Vamana sent Bali down to rule the underworld. In his form as Parasurama, Vishnu appears as a priest (Brahman) who comes to the world to kill bad kings and protect humanity from danger. He appears in the form of a man carrying an ax, sometimes referred to as Rama with an ax. In the original story, Parasurama appeared to restore Hindu social order which had become corrupted by the arrogant Kshatriya caste. Lord Rama is the seventh avatar of Vishnu and a major deity of Hinduism. He is considered supreme in some traditions. He is the central figure of the ancient Hindu epic "Ramayana" and is known as King of Ayodhya, the city believed to be Rama's birthplace. According to the Ramayana, Rama’s father was King Dasaratha and his mother was Queen Kausalya. Rama was born at the end of the Second Age, sent by the gods to do battle with the multi-headed demon Ravana. Rama is often depicted with blue skin, standing with a bow and arrow. Lord Krishna (the divine statesman) is the eighth avatar of Vishnu and is one of the most widely revered deities in Hinduism. He was a cowherd (sometimes depicted as a charioteer or statesman) who shrewdly changed rules. According to legend, the famous poem, the Bhagavad Gita, is spoken by Krishna to Arjuna on the battlefield. Krishna is depicted in a variety of forms because there are so many stories surrounding him. The most common story describes Krishna as a divine lover who plays the flute; he is also described in his child form. In paintings, Krishna often has blue skin and wears a crown of peacock feathers with a yellow loincloth. Balarama is said to be the elder brother of Krishna. It is believed that he engaged in many adventures alongside his brother. Balarama is rarely worshiped independently, but stories always focus on his prodigious strength. In visual representations, he is usually shown with pale skin in contrast to Krishna's blue skin. In a number of versions of the mythology, Lord Buddha is thought to be the ninth incarnation. However, this was an addition that came after the dasavatara was already established. Kalki (meaning “eternity” or "mighty warrior") is the last incarnation of Vishnu. He is not expected to appear until the end of Kali Yuga, the current time period. Kalki will come, it is believed, to rid the world of oppression by unrighteous rulers. It is said that he will appear riding a white horse and carrying a fiery sword.